Critical language refers to the use of standardised communication in which specific terms or phrases have a clearly defined, mutually understood meaning. CICO Rescue is the term used by the Vortex Approach to describe emergency cannula or scalpel cricothyroidotomy/tracheotomy procedures required during can't intubate, can't oxygenate (CICO) events. Unlike many other terms applied to this procedure (emergency surgical airway, emergency front-of-neck access, invasive airway access, infraglottic rescue, etc) CICO Rescue satisfies the criteria required of such a term in being simple, intuitive, precise, unintimidating and inclusive of both cannula/scalpel techiques performed on either the cricothyroid membrane or trachea. There is considerable variation in the way the CICO acronym is verbalised by clinicians. In addition to spelling out C-I-C-O, phonetics range across Kick-Koh, See-Koh, Chee-Koh, Sic-Koh and Psy-Koh. To facilitate clear, efficient communication during an airway crisis, the Vortex Approach encourages consistent prounciation of the CICO acronym as Ky-Koh. According to the Vortex Approach the trigger for initiating CICO Rescue is the inability to confirm alveolar oxygen delivery following completed best efforts at all three upper airway lifelines. Note that this trigger is independent of the oxygen saturations since, even in the unusual situation where following best efforts at all three lifelines the oxygen saturations remain high, the inability to confirm alveolar oxygen delivery following best efforts at all three lifelines means that eventual desaturation is inevitable. Rather then being a deterrent to its performance, recognition of the need for CICO Rescue while the oxygen saturations remain high should be viewed as advantageous - providing increased time to perform this confronting procedure in a more controlled manner, thereby increasing the chance of success. Conversely a critically low oxygen saturation is not in itself a trigger to initiate CICO Rescue if best efforts at all three lifelines have not been completed. While legitimate opportunities to enter the Green Zone in a timely fashion via the familiar upper airway lifelines remain, these should be exploited as they are more likely to be successful than resorting to an unfamiliar and more traumatic technique. Thus oxygen saturations are not a relevant consideration in deciding the trigger for CICO Rescue - they are, however, a relevant consideration for determining how many attempts are reasonable before declaring a best effort at a lifeline in a particular situation. When the oxygen saturations are critically low it might be reasonable to have only one attempt at each lifeline before proceeding to CICO Rescue. The accompanying video (left) addresses a number of concerns raised with the Vortex Approach including a detailed discussion of the rationale for performing CICO Rescue if the oxygen saturations are still high (note that this video refers to an older version of the Vortex that uses a slightly different graphich and nomenclature to the current version). Cognisance: the clinician must be well informed of the efficacy and complications of different techniques for the management of CICO as they apply to their clinical practice and know in advance which technique is most appropriate in a given clinical situation. There should not be scope for indecision about the technique to be implemented once a CICO event arises. Competence: the clinician and their team must be adequately trained in their chosen technique(s) (technical preparedness to perform CICO Rescue). Given the infrequent nature of CICO events, the competence of clinical teams in CICO Rescue cannot be achieved by one off training sessions but requires conscientious, repeated training at regular intervals to prevent skill attrition. Capability: the clinical team must have immediate access to the resources required to perform their chosen technique. It is recommended that pre-packaged CICO Rescue kits are immediately available to facilitate access to the equipment required for whatever technique is preferred. The efficient implementation of CICO Rescue when it is needed also requires clinical teams to be trained in the process of priming for CICO Rescue using this equipment. In clinical practice priming for CICO Rescue has the ancillary benefit of providing additional opportunities to reinforce the process of escalating towards CICO Rescue even in circumstances where a CICO event does not occur. By encouraging familiarity with escalation towards CICO Rescue during more common difficult airway events, priming has the potential to overcome the 'taboo' of confronting the potential for CICO Rescue in everyday practice, thereby facilitating both the technical and psychological preparedness of clinical teams to deal with a CICO event when it does occur. Context: the clinical team must have a clear understanding of when to initiate CICO Rescue. This requires that they are able to clearly define the clinical criteria that indicate a CICO situation exists (recognition) and can clearly and unambiguously communicate this to the rest of the team using consistently understood, standardised critical language (declaration). Confidence: the clinical team must have the resolve to act when this potentially confronting procedure is required (psychological preparedness to perform the CICO Rescue). The above principles are consistent with the position of the Australian & New Zealand College of Anaesthetists in relation to CICO Rescue. Videos demonstrating both the cannula and scalpel techniques for CICO Rescue developed at Royal Perth Hospital, as well as the technique for safe oxygen insufflation when using a cannula technique, are available via Dr Andrew Heard's YouTube channel. The Vortex CICO Rescue trainer consists of 2 components: a larynx component that inserts into a neck baseplate to provide realistic anatomical features for practising of CICO Rescue techniques. 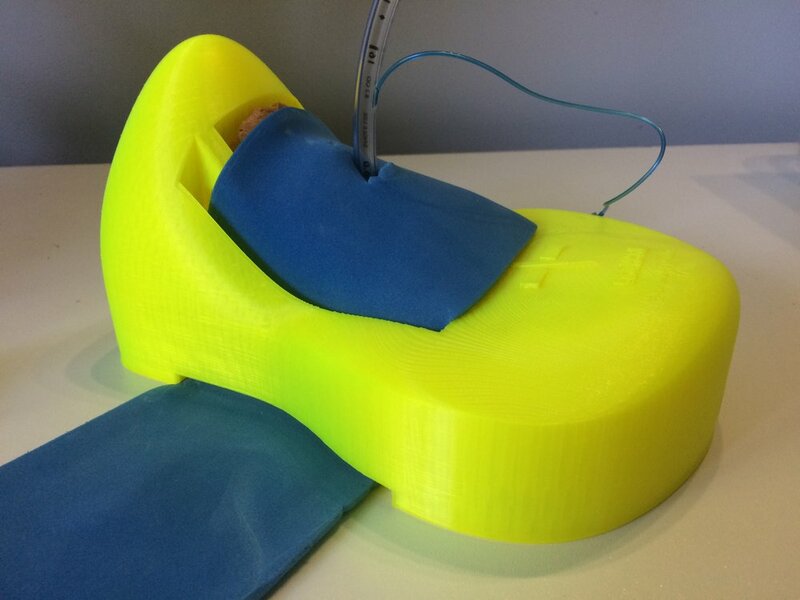 The laryngeal component of the trainer is based on original files by University of Dundee, BodyParts 3D and The Database Center for Life Science which have been extensively developed by Dr Andy Buck who also created the neck baseplate. The infrequent and varied nature of CICO events makes obtaining clinical evidence of the best technique for CICO Rescue challenging. 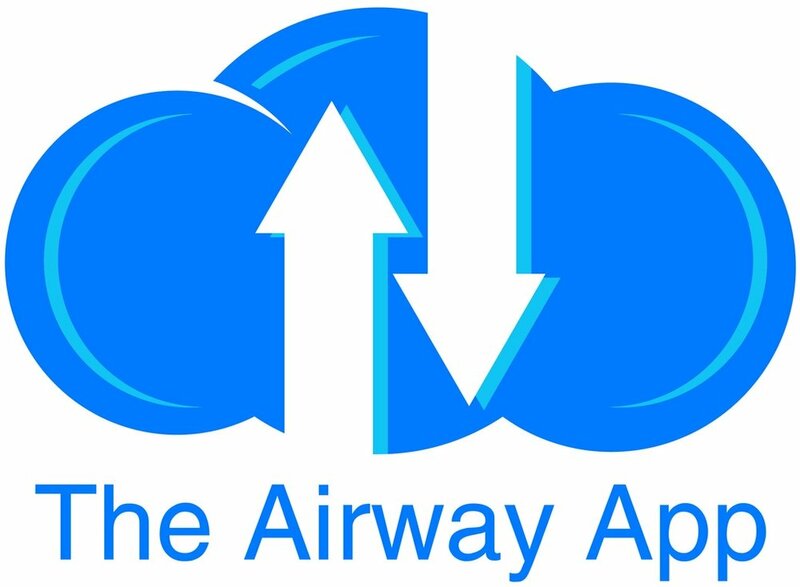 Developed by Dr Laura Duggan and the International Airway Collaboration, the Airway App provides a simple, anonymous method for clinicians to share their experiences of CICO Rescue (& awake intubation) and so increase the knowledge base in this area. Click on the image to the left to download the app. The term 'priming' was coined for the Vortex Approach to refer to an escalation in readiness to perform CICO Rescue that occurs prior to recognition of a CICO situation. This includes activities that occur during an evolving airway crisis in parallel with attempts to enter the Green Zone via one of the upper airway lifelines, not just preparatory activities that only take place in the more static setting before the initiation of airway management. Priming is distinct from preparatory activities which only take place after a declaration of CICO. Priming is crucial to ensure that airway management teams are poised to perform CICO Rescue with zero latency when CICO is declared, without any additional delay during which patients may be exposed to ongoing hypoxia. Trigger: the onset of an airway crisis is frequently insidious. Even during routine airway management, it is not uncommon for optimisations to be required before entering the Green Zone. The gradual evolution of these routine issues into an airway emergency makes it difficult for clinical teams to identify and declare a clear point of onset for a crisis and thus a trigger to initiate priming. Outcome: initiation of priming in an appropriate timeframe will not usually culminate in a declaration of CICO or the need for CICO Rescue. To be effective, priming must be initiated early in the management of the challenging airway. Given that CICO events are so uncommon, it would be expected that in most cases the airway will subsequently be successfully managed by one of the upper airway lifelines. Thus initiation of priming will not usually culminate in a declaration of CICO or the need for CICO Rescue. The lack of a clear trigger for early escalation and the fact that early escalation will almost always ultimately represent a 'false alarm', has the potential to create a barrier to effective priming. Clinicians may be reluctant to initiate priming early due to concerns about being seen to have panicked or overreacted. While the Vortex tool defines when performance of CICO Rescue is indicated, it does not in itself provide a clear trigger to initiate priming for CICO Rescue. To facilitate effective priming for CICO Rescue, the Vortex Approach uses the CICO Status tool as an adjunct. Inspired by Scott Weingart's CriCon concept, this tool helps to address the above issues by linking specific pre-defined priming actions to objective criteria in the management of the challenging airway in a manner that is integrated with the Vortex model. Using a three tiered Ready-Set-Go system, the CICO Status escalates with the declaration of a completed best effort at any lifeline that does not provide entry to the Green Zone. Visually this is conceptualised as descent further into the funnel of the Vortex. Adopting a structured and standardised approach to priming shares the responsibility for escalation with the team, removes the perceived focus on the 'anxiety' of an individual clinician for initiating priming and reduces the barriers to timely escalation towards CICO rescue. CICO Status to READY: In the situation where a best effort at one lifeline has been completed without providing entry into the Green Zone the CICO Status escalates to READY. This prompts the team to call for help, allocate someone to perform CICO Rescue (in case this ultimately becomes necessary) and confirm that the equipment to perform CICO Rescue is available at the bedside. These actions encourage the team the contemplate the possibility of CICO Rescue early, ensure that an appropriately skilled clinician is allocated to perform the procedure and allow the allocated proceduralist to begin preparing both practically and psychologically to perform this confronting intervention. It is not necessary to open the CICO Rescue kit as this stage. CICO Status to SET: In the situation where best efforts at two lifelines have both been unable to provide entry to the Green Zone, the CICO status escalates to SET. This mandates the airway management team to take all steps towards CICO Rescue without actually initiating the procedure itself. This should include assembling equipment for the preferred initial technique, identifying and marking landmarks by palpation (or using ultrasound where this will not delay performance of CICO Rescue if CICO status escalates to GO) and, time permitting, infiltrating with adrenaline containing local anaesthetic to reduce bleeding. At the completion of the SET phase, the team should be poised to perform CICO Rescue immediately if the CICO Status escalates to GO. The CICO Status should not escalate beyond SET unless best efforts at all three upper airway lifelines have been unable to secure entry into the Green Zone. CICO Status to GO: In the rare situation where best efforts at all three lifelines have been unsuccessful, the CICO Status escalates to GO. At this stage the patient should be pulled towards the head of the bed to allow extension of the neck, and CICO Rescue initiated. The priming process encouraged by the CICO Status tool should enable CICO Rescue to be implemented with minimal delay once a CICO situation is declared. Where a cannula technique is intended and the oxygen saturations are still >90% it is sufficient to re-establish airway patency using a cannula (a relatively low-risk procedure) and delay insufflation of oxygen (the component of cannula oxygenation associated with most risk), secure in the knowledge this can be readily instituted if oxygen saturations begin to fall. As well as the mandatory escalations with completed best efforts at any one lifeline, additional discretionary escalations of the CICO status may be suggested by members of the team according to other recommended criteria on the tool or their own clinical judgement. In order to facilitate early requests for assistance, escalation to READY is strongly recommended when consecutive individual attempts (not necessarily best efforts) at any two lifelines occur without achieving entry into the Green Zone (e.g. if 1st attempt at intubation and 1st attempt at face mask ventilation fail to achieve alveolar oxygen delivery). In an anticipated difficult airway, where there is perceived to be a high risk of needing to proceed rapidly to CICO Rescue, airway management may even begin with the CICO Status already at SET (the "double setup"). The declaration of a completed best effort at any lifeline should be accompanied by a request to escalate the CICO status. If this is not made by the airway operator, other members of the team should feel empowered to insist on this. It is important to note that the CICO Status should not reach GO unless best efforts at all three lifelines have failed to provide entry into the Green Zone. Once the CICO Status reaches SET it should plateau here until a declaration is made that best efforts at all three upper airway lifelines has been unsuccessful. If, following any escalation in the CICO status, entry into the Green Zone is subsequently achieved by an attempt at an alternate lifeline, no further progression is warranted while access to the Green Zone is maintained. The CICO Status should remain at the escalated level, however, in case access to the Green Zone is inadvertently forfeited and a return to the funnel of the Vortex occurs. Only once a secure airway that is suitable for the context has been established, should the CICO Status 'stand down' to its default 'neutral' status. It is appropriate to consider the need to reinstitute a previously elevated CICO Status in any circumstance where secure access to the Green Zone has the potential to become compromised, such as during extubation. Kits should be constructed with attention to the available evidence for effectiveness and safety of different techniques. In particular a clear understanding of the equipment and technique requirements for safe performance of oxygen insufflation when using a cannula CICO Rescue technique should be understood (more information on this is available here). Kits should be constructed in consultation with the clinicians who will use them so as to incorporate their preferences. Effectiveness of a CICO Rescue technique is dependent not only on its likelihood of technical success but also on a clinicians willingness to implement it. Equipment should be available for both cannula and scalpel based CICO Rescue techniques so that the appropriate choice can be made according to context and individual clinician preference. Equipment for a cannula technique for CICO Rescue must include an oxygen insufflation device that allows expiration via the cannula. This is not possible using a Manujet or 3-way tap device unless the they are disconnected from the cannula (which risks it becoming dislodged). Insufflation devices that permit expiration via the cannula include the Rapid O2, Ventrain, Enk Oxygen Flow Modulator as well as intermittent application of oxygen tubing to the cannula followed by its removal between each insufflation (again this latter technique increases the risk of dislodging the cannula). All clinicians (both medical staff and airway assistants) should be trained to ensure competence in the use of the kits. Transparent packaging of kits permits examination of the contents without needing to open them. This allows clinicians to familiarise themselves with the contents at any time. Additionally, in the context of an evolving airway emergency when CICO Status is escalated to READY, it provides the opportunity for the allocated clinician to confirm availability of the desired equipment and mentally rehearse the procedure. Use of cheap, readily available components rather than reliance on specialised kits makes ubiquitous access to CICO Rescue equipment more cost effective. In addition it allows for easier standardisation of equipment whilst retaining maximum flexibility in technique so as to allow individual clinicians to use a single consistent CICO Rescue technique across sites. Needle Pack Contents: 14G Insyte cannula, 5ml syringe, 10ml 0.9% Saline, Rapid O2 insufflation device. Scalpel Pack Contents: Size 10 scalpel, Frova intubating catheter, Size 6.0 cuffed ETT. Cannula Kit Contents: 14G Insyte cannula, 5ml syringe, 10ml 0.9% Saline, Rapid O2 insufflation device. Scalpel Kit: Size 10 broad blade disposable scalpel, Size 6.0 cuffed ETT, Frova intubating catheter, Cook 15mm Rapifit adaptor. Cannula Kit Contents: 16G Insyte cannula, 5ml syringe, 10ml 0.9% Saline, Rapid O2 insufflation device. The concept of 'transition' was developed by the Australian and New Zealand College of Anaesthetists (ANZCA) Airway Management Working Group in their transition document (right). The Vortex Approach describes transition as "the phase of care leading up to and including the potential declaration of CICO and performance of CICO Rescue". This description is broader than that used by ANZCA, in recognition of the fact that there are both practical and psychological barriers to puncturing the anterior neck that must be negotiated even after a "committed declaration of a CICO event". This revised description also reflects the fact that the occurrence of transition should be able to be identified prospectively and that in most cases it will not result in a declaration of CICO. According to the Vortex Approach, transition commences with the onset of priming and concludes with entering the Green Zone using a definitive airway technique. In this context, the term 'definitive' refers to an airway satisfying all the goals of airway management (both primary and secondary) in the particular context for which airway management was undertaken, such that conversion to another technique is not anticipated. According to the circumstances a definitive airway may potentially be achieved via CICO Rescue or using one of the upper airway lifelines. It does not necessitate intubation of the patient. What constitutes an appropriate definitive airway in a particular situation will vary. If for example, intubation or withdrawal have been identified as the required endpoint to airway management in a particular situation, transition does not conclude with entry to the Green Zone using a supraglottic airway and the team should remain primed until entry to the Green Zone is secured using the appointed definitive airway. Transition is a key concept in management of the challenging airway which acknowledges that the shift in focus from attempts to enter the Green Zone via the upper airway lifelines, to achieving this via CICO Rescue, should be a process rather than a pivot - occurring over a period of time instead of at an instant in time. Prevention: for transition to be effective it must only culminate in the initiation of CICO Rescue when absolutely necessary. Prevention of a CICO event depends on both maximising opportunities to establish airway alveolar oxygen delivery via the upper airway lifelines as well as avoiding precipitating loss of the ability to achieve alveolar oxygen delivery when this has previously been established. The process of prompting for optimisation of the three upper airway lifelines specified by the Vortex addresses the former aspect and the Green Zone addresses the latter. Priming: the process of priming for CICO Rescue outlined above is initiated in response to acknowledgement of the diminishing likelihood of success at achieving alveolar oxygen delivery via any of the upper airway lifelines an increasing possibility (yet still not a probability in the vast majority of cases) of the potential need for CICO Rescue. Priming must occur in parallel with ongoing attempts to optimise success at the three upper airway lifelines of face mask, supraglottic airway and endotracheal tube. The CICO Status tool is used by the Vortex Approach to facilitate priming. Permission: clear recognition that a CICO event exists and declaration of its occurrence to the team contribute to clinician confidence that it is appropriate to perform this confronting procedure and thus their resolve to initiate CICO Rescue. The Vortex implementation tool facilitates permission for CICO Rescue by providing a defined endpoint to optimisations for each lifeline and enhancing team situational awareness of the occurrence of a CICO event. Puncture: refers to the technical aspects of initiation and performance of CICO Rescue, including the ability to access the necessary resources (staff and equipment). While these technical aspects are not core areas of the Vortex Approach, it assists in addressing them through the process of clinical integration (such as use of the iconography of the Vortex Approach to make pre-packaged CICO Rescue kits more readily identifiable in a crisis) and by emphasising the importance of critical language (to ensure requests for equipment are clearly understood and are made using terminology that is consistent with the manner in which that equipment is labelled). While the Vortex Approach addresses many aspects of these 4 elements, other factors also have significant contributions to make. In addition to the implementation tools provided by the Vortex Approach, successfully executing the transition process requires attention to all of the above elements using an integrated approach that addresses both technical and human factors in relation to training, planning, monitoring and equipment.